As a kind of change from my Cuba series – which I will continue – I post today a shot from Prague taken from the Charles bridge. Very nice shot! I particularly like the way the statues form repeating figures throughout the image, in varying degrees of silhouette. The range of colors in the sky really gives this image a great atmosphere. Wonderful work here. hahaha that was my first thought Thomas….Prague! I've been there this holiday and it's realy a great city!! 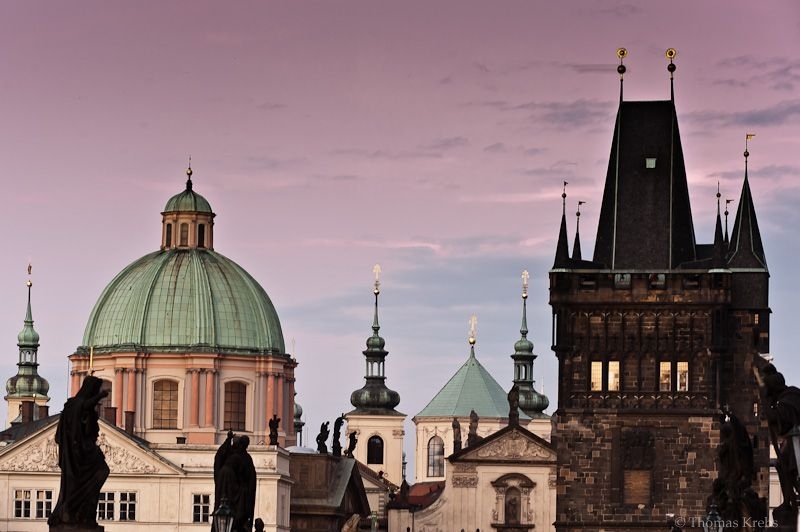 This is a fantastic composition of the monuments of prague! Good work! Beautiful shot, and the color of the sky makes it more beautiful! lovely colors and nice sky! Das konnte ich nicht zuordnen und musste erstmal lesen 😉 Wirkt toll der Türmemix in Verbindung mit der Himmelsfarbe, sehr gelungen. You have chosen an awesome perspective here. Love the pastel colors and the warm evening light. This city is so amazing. But at the same time it's really difficult to get great photos there, because it's allways so crowed everywhere. This photo is really good. Great lighting and use of the depth of field, compressing all this amazing architecture in one plain. nice framing, the tones are great.